You can query whether a particular feature set is available on the current device by calling supportsFeatureSet: on a Metal device. GPUFamily1 is explicitly identified by Apple with the A7 processor, while GPUFamily2 corresponds to the A8, the processor in the iPhone 6 and iPhone 6 Plus. There are not too many substantial differences between the two, except that the A8 supports a greater number of color attachments on render passes (eight, instead of the four supported by the A7). 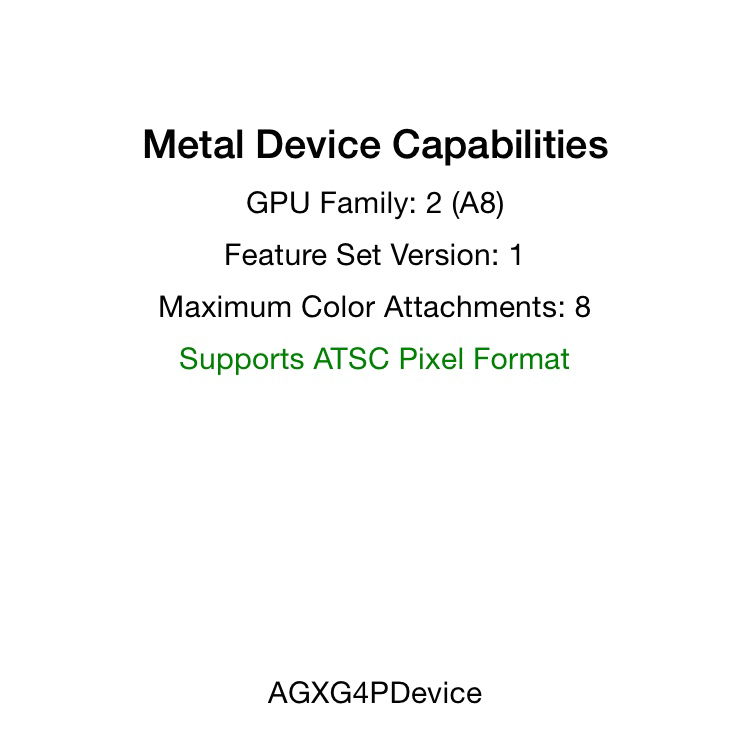 The A8 also adds support for Adaptive Scalable Texture Compression (ATSC), a relatively new compression available in Metal on the newest iOS devices. Creating an instance of MBEDeviceCapabilities produces an object that can supply the more granular device capability information displayed in the screenshots. This class infers the capabilities of the device based on the supported feature set reported by the device. The bottom line on the display shows the concrete type of the Metal device returned by MTLCreateDefaultSystemDevice. When running under the debugger, this is always MTLDebugDevice. 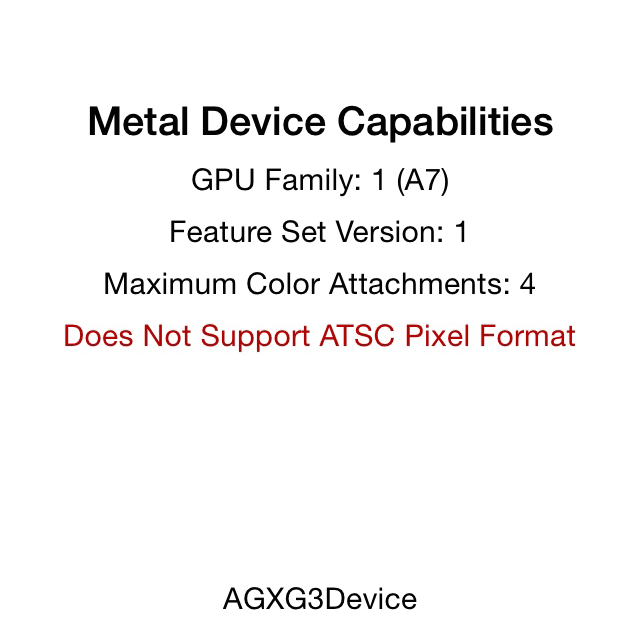 Interestingly, when not running under the debugger, the device class is device-specific: AGXG3Device (for iPhone 5s and iPad mini with Retina display) or AGXG4PDevice (for iPhone 6). You can download the sample code for this post here. If you run the project on your own device and see a different device class, please let us know in the comments.